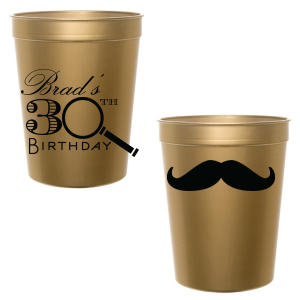 Looking for a fun party theme for this year’s Halloween party or for an upcoming milestone birthday? This year, host a fabulous murder mystery party! Set an intimate scene, invite your friends who are most likely to go all out for the sake of the party, and soon you’ll be playing detective together. 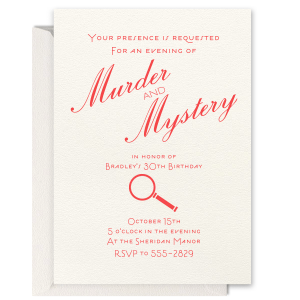 Starting with the captivating invitation down to details like murder mystery theme party napkins, everything you need to host a murder mystery dinner party is right here! Choose your mystery themed party supplies, then add in your characters and mystery storyline and you're ready to spend an entertaining evening solving clues! There are countless murder mystery party kits available online, so make sure to read up on those and choose the perfect one. We like this one. It’s available as a PDF download, so you get it instantly, and it’s set in the 1920’s, the same decade as the game of Clue! 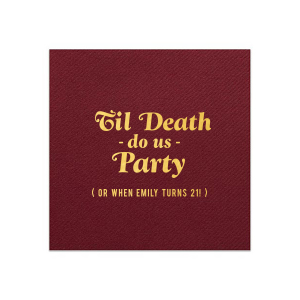 Once you have your murder mystery party kit, you can read through the characters and costume requirements, start your guest list and plan your custom party accessories. Send each guest a personal message with their invitation, giving them a detailed description of the character they are slated to play. Tell your guests to wear a costume appropriate for their assigned persona and that everyone will be a suspect for the murder. Of course, try to match your guests with a character that they will feel at ease with — you don't want anyone feeling uncomfortable. Most murder mystery kits have a minimum number of players, but then add a selection of optional characters so you can invite a few extra guests. You'll want your home to reflect the mood of the event to get your guests in character. For a 1920’s Clue inspired decor theme, show off any art deco pieces in your home and incorporate extravagant feathers as accessories. 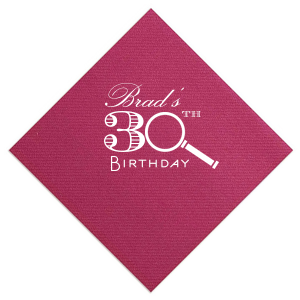 Deep jewel tones in your party colorway will reflect a vintage 'Clue-like' vibe. Place a few votive candles around the space to achieve the perfect mysterious aura, and dramatic colored personalized party supplies will be a great finishing touch! Guests can snack on traditional bar food, like popcorn, spiced nuts and mini sandwiches, or you can go all out with a multi-course meal, with some mystery solving in between each course. For your signature cocktail offerings, offer something like a gin rickey – a fizzy concoction of lime, soda and gin. Or you could mix up mint juleps, favorites in The Great Gatsby, a classic book set in 1922. 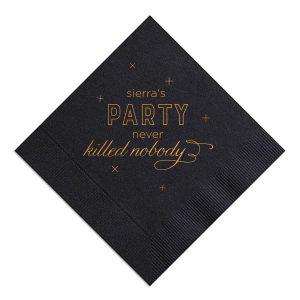 Custom cocktail napkins will dress up your snazzy signature cocktails and with the right design, your guests will likely tuck an extra into their beaded handbags as a memento. As for the apparel, you and your guests can choose to don glamorous flapper dresses with a bit of red lipstick and a long string of pearls, or you could opt for one of the daring women’s pantsuits from the 1920s. Camille Styles hosted a Clue-inspired party years ago that has some gorgeous costume inspiration. Men can stick to dapper suits, with fun accessories like monocles, pipes, and hats that match the time period. 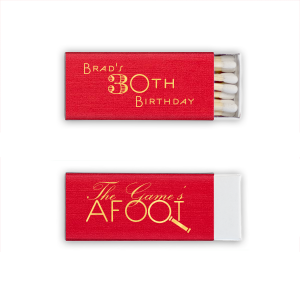 Whatever you decide about the details, your guests are sure to have a good time. Who doesn’t like getting into a fabulous costume and drinking delicious cocktail?! There’s no mystery about that!